Targetting Mono in Visual Studio is possible. This way your assemblies are build using the Mono framework (which should be .NET compatible). Change the target to the Mono profile to get immediate feedback of incompatible references and other Mono things. This can be done in the Properties > Application tab of your project. To get this working you’ll need to register mono as a profile, just like the client profiles from Microsoft. Below are links to the files created / used. The Registration only contains the FrameworkList.xml file, two registry files and a readme.txt. The Complete adds the Mono files which makes the file big(ger). This entry was posted in Development and tagged .NET, framework, Hack, mono, profile, target, Visual Studio 2010. Bookmark the permalink. 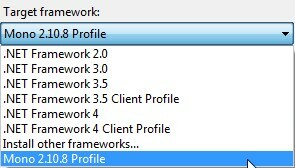 When I attempt to load my solution after choosing “Mono 3.2.3 Profile”, I get “This application requires […] .NetFramework,Version=v4.0,Profile=Mono”. I double- and triple-checked what I did. My registry key appears correct. I copied my files as directed. Please make sure to use the program files (x86) folder when you’re on a 64 bit machine. The type initializer for ‘Gtk.Application’ threw an exception. Yura, I’m not a gui developer on the mono framework, but I’ve got the same exception you have. I fixed it by changing the Debug settings in the project properties. Now I’m lookin at the “helloworld” window. Eric, I have a client who is using Xamarin.iOS, which apparently requires .Net 3.5. What registry key would I need to add a 3.5 Mono project? Hi gregsdennis, not sure what you want to achieve here. I tried that and when I downloaded the Xamarin framework, it only had 4.0. I think that my client may be using an older version on Xamarin. I’m continuing to work with him to figure out a solution that works for both of us. Thanks for looking into it, though. Hi thanks for the info, it has helped me get VS working with Mono although now I am stuck and was wondering if you could help? I’ve only been an owner of a Raspberry Pi for a short time and do not have a background in Linux. My background is primarily in embedded C but more recently C# and .NET. 1) Just built and tested the application in VS as normal and then copied to my PI running the executable with mono. 2) Set VS project properties to target Mono rather than .NET, built and tested the application and then copied to my PI running the executable with mono. Both of the above methods generated the exceptions shown below in A. 3) Within VS, I changed the properties of the ServiceModel reference to copy locally and moved the resultant dll with the executable to my PI then running the executable with mono. This 3rd approach generated the exceptions as shown in B. A typical project for me would be controlling HW and therefore not utilising ASP.NET where I have very little experience. The idea of moving to the PI from PIC based designs / Arduinos and so on was to start to play with more web oriented projects hence this attempt to communicate over HTTPS with an existing service. I would really appreciate it if anyone could explain what may be happening. System.IO.FileNotFoundException: Could not load file or assembly ‘System.ServiceModel, Version=4.0.0.0, Culture=neutral, PublicKeyToken=b77a5c561934e089’ or one of its dependencies. [ERROR] FATAL UNHANDLED EXCEPTION: System.IO.FileNotFoundException: Could not load file or assembly ‘System.ServiceModel, Version=4.0.0.0, Culture=neutral, PublicKeyToken=b77a5c561934e089’ or one of its dependencies. System.TypeLoadException: Could not load type ‘System.ServiceModel.BasicHttpBinding’ from assembly ‘System.ServiceModel, Version=4.0.0.0, Culture=neutral, PublicKeyToken=b77a5c561934e089’. [ERROR] FATAL UNHANDLED EXCEPTION: System.TypeLoadException: Could not load type ‘System.ServiceModel.BasicHttpBinding’ from assembly ‘System.ServiceModel, Version=4.0.0.0, Culture=neutral, PublicKeyToken=b77a5c561934e089’. My first guess would be the wrong version of Mono installed. Can you run a simple “hello world” compiled in VS on your raspberry? I don’t have a raspberry pi but can test this scenario on my synology NAS as it supports some version of mono. Thanks for such a fast reply! The version of Mono I am using is 3.2.8. That’s just what I ended up with when I installed it on the Pi yesterday. I have successfully tried a Hello World and a basic input output console application that worked fine on the PI. As I have recently had the need to communicate with a webservice from .NET, I decided to give the same code a go with mono on the PI hence the issue. I really wanted to get the confidence that using mono was the right choice for me for PI coding based on having some .NET experience. Tried adjusting the MONO_LOG_LEVEL / MONO_PATH? Hi, Christian. I have a vague memory of seeing a similar exception, but the filename shown in my experience was not System.ServiceModel or System.ServiceModel.BasicHttpBinding. I recall solving this issue by running “sudo apt-get install mono-complete” rather than “sudo apt-get install mono-runtime”. Mono-runtime appears to install only the basic stuff, but mono-complete will give you ALL the assemblies available in dotNet (or so I think). Could you try giving “sudo apt-get install mono-complete” a shot? I am trying to migrate a pc application, I wrote in C# to a Mac environment using Mono. I followed your instructions step by step, except that the current version of Mono is now 4.01. Visual Studio 2012 told me that it was targeting to Mono 4.01, but the compiled version was identical to that targeted at .Net 4.0. In fact, the byte count of the .exe file was identical. What did I do wrong? Did the application work on your Mac? Checking for incompatible code is my only reason to use the compiler from the mono framework. 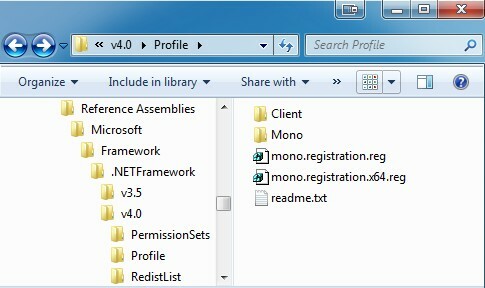 Both the .NET compiler and mono compiler should result in the same assembly. Dose it work with mono 4.6.1 (Dot net 4.6.1)? Microsoft has done lots of work since 2012. I think this will still work but you’ll have to try it for yourself since I’ve moved on. Please report back with your experience.